Cabernet Sauvignon by Taltarni of Pyrenees. Crafted exclusively from estate grown fruit, Taltarni expresses the complexity, flawless structure and great length of epic Pyrenees Cabernet. Characterized by its controlled power, elegance and finesse, a very special Pyrenees wine which redefines the great Cabernet virtues of stature, structure and length. 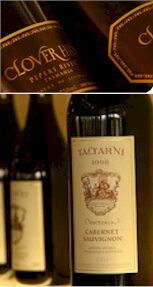 Taltarni's great legacy is deeply rooted in the unique combination of low yielding gravelly loam soils of its vineyards and the temperate climate of the Pyrenees, producing wines hallmarked by eloquent regional charm. A mighty Pyrenees Cabernet Sauvignon, driven by a masculine weight of fruit, supported by a framework of stylish French oak.